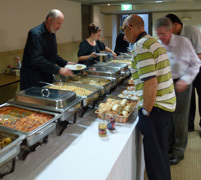 In end-of-year party mode on Nov 30, the team of St Patrick's Marist community showed their appreciation of the work of scores of staff, volunteers and other helpers throughout 2012. In the crypt celebration parish priest, Fr Ray Chapman SM, thanked the dinner guests for the wide of range of contributions made throughout another year. He paid special tribute to Fr Peter McMurrich who leaves St Pat's shortly to take up the role of vicar-provincial of the Australian Province and superior of the Villa Maria Marist community at Hunters Hill, NSW. Frs Ray Chapman and Peter McMurrich are pictured, left. 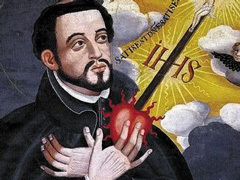 As the journey of the relic of St Francis Xavier in Australia nears its end, Fr Jim Carty SM recalls its historic 1949 journey from Rome to commemorate the 400th anniversary of the saint's arrival in Japan. Fr Jim's father, Bill Carty, a renowned wartime combat photographer, moved with his young family from Sydney to post-war Japan as a newsreel cameraman. In 1949 he covered the tour of the relic to the principal towns and cities associated with the saint's brief but fruitful ministry in 16th century Japan. 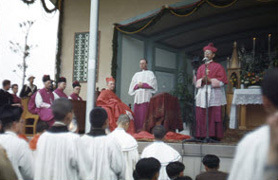 Amongst Fr Jim's keenest memories as a 10 yr old was his fascination with the 35m-long scarlet 'cappa magna' of Papal Legate, Australian Cardinal Norman Gilroy, at the open air Mass at Nagasaki. 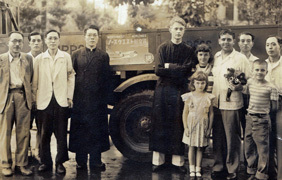 Above: The Carty family (right) with Kyoto's Bishop Furiya (left) and Maryknoller, Fr Steinbeck / 10 yr old Jim Carty (highlighted) with occcupational forces' youngsters in Tokyo. St Francis Xavier / Bishop Peter Comensoli accompanying the relic in Australia. During his 3-month sojourn in Nara, Fr Paul Glynn SM has organised a pilgrimage of aid to bring hope to Fukushima tsunami survivors in the north of Japan. 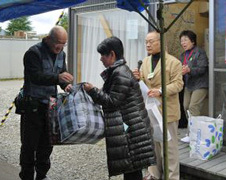 Members and friends of the Australian Japanese Catholic community joined the group at Fr Paul's base in Tomigaoka for the journey to Fukushima, offering warm clothing, home needs and financial support, including for children orphaned by the disaster which claimed 19,000 lives. Many survivors are housed in temporary dwellings while they must wait five years before returning to their radiation-contaminated homes. 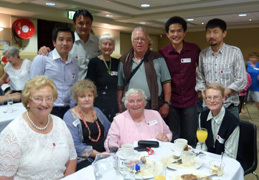 Above: Australian visitors join Fr Paul Glynn and Tomigaoka parishioners in the pilgrimage of aid to Fukushima. 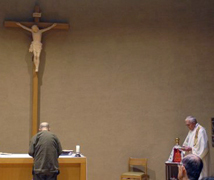 Below: A Buddhist monk prays during Mass with Fr Paul / visitors sing songs of hope to Fukushima survivors. A man and his dog outside their temporary home / delivering aid amongst the temporary dwellings. St Patrick's Courtyard Coffee Shop held its annual 'Sparkling High Tea' in the crypt of St Patrick's on Nov 24 for volunteer workers and friends of the popular Sydney gathering place. In addition to champagne and other party fare, guests were treated to the music of the 'Mighty Mouse', Angela Chan, and accompanist, Daniel Rojas. 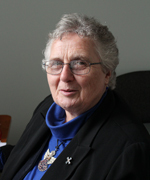 After 50 years of religious life, including 45 years in Catholic education in Ireland, England, New Zealand and Australia, Marist Sister Fidelis McTeigue SM has started a new ministry. 'I love my job! ', declares Sr Fidelis, newly-appointed pastoral associate at St Patrick's, Church Hill, Sydney. 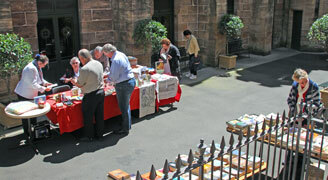 In addition to liturgy preparation in the parish, Sr Fidelis manages the popular book and religious items stall on Sundays in the courtyard of St Patrick's. 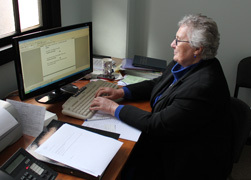 In her previous ministry Sr Fidelis was deputy-principal for 6 years and principal for 27 years of Marist Sisters' high schools at Merrylands and Woolwich. Frs Andrew Murray and Gerry Arbuckle have each launched a book in recent days. Fr Andrew's 'Thinking Things Through: Essays in Philosophy and Christian Faith' was launched at the Catholic Institute of Sydney on Nov 15 while Fr Gerry's 'Humanizing Healthcare Reforms' was launched at Heythrop College, London, on Nov 17. 'Thinking Things Through' is available from ATF Press and contains Fr Andrew's reflections on a range of life issues since the mid-nineties. Download newsletter directly from here. Communities of the Society of Mary across the world have begun to celebrate the beginning of the 'Colin Year' honouring their Founder, Ven Jean-Claude Colin. The start of the Colin Year coincides with the launch of www.jeanclaudecolin.org which will provide an ongoing focus on the Beatification Cause of Fr Colin and a source of resources for communities, schools and Marist lay groups. 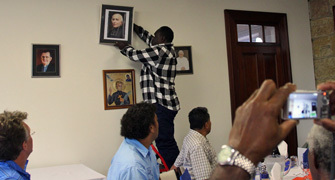 Above: Davao, Philippines: District superior, Fr Pat Devlin, presides at a Colin Year Eucharist on Nov 15 / display of the 'Colin icon explained'; Sydney, Australia: S&L participant, Fr Austin Magara, enshrines a Tollet painting of Fr Colin in the dining room of Villa Maria Monastery, Hunters Hill / community celebration with French decor on Nov 15. Below: Callao, Peru: Bishop Luis Sebastiani SM and concelebrants at a Colin Year Mass and display of the Jean-Claude Colin icon / Peru's Marist Laity latest 'welcome' banner. 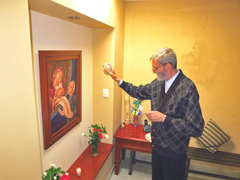 Mexico: Fr Jean Vienne, Provincial of Mexico, blessing the icon at the recently opened Marist formation house, 'Seminario Marista Juan Claudio Colin'... / ... watched by several Mexican Marists, priests, seminarians and lay people. 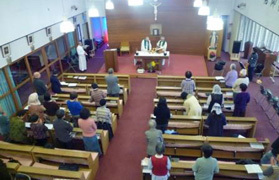 Further below: Tomigaoka, Japan: Fr Paul Glynn presides at Mass on Nov 15 for 'Life in the Spirit' participants. The 'mastead' of the Colin website. As part of their program addressing a range of lifestyle and ministry issues, the 'Spirituality & Lifestyle' group at Villa Maria, Hunters Hill, met with the Justice, Peace and Integrity of Creation Committee of the Australian Provnce on Nov 12. 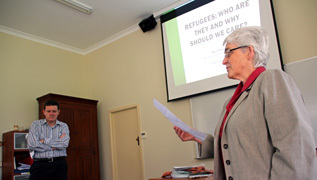 Pictured, left, JPICC convenor, Fr Jim Carty SM, sharing on refugee and asylum seeker issues. 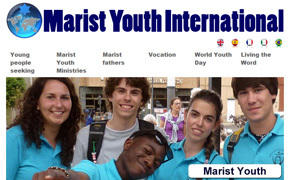 Pictured below, Fr Alejandro Munoz SM, international coordinator of vocations for the Society of Mary, announces the launch of the 'MYI' website. CEO of the Refugee Council of Australia, Paul Power, led an afternoon's reflection on refugee and asylum seeker issues with Marist Sisters from the Sydney area on Nov 10. 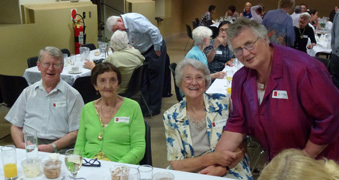 Organised by the JPIC group of the Marist Sisters, the session explored the plight of refugees and asylum seekers in Australia and comparisons with treatment in other countries of the world's 42 million displaced persons. Filipino 'Spirituality & Lifestyle' program participant, Fr Chris Ganzon SM, has celebrated ten years of Marist priesthood while in Australia. 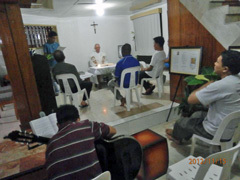 As formation director for young Marists in the Marist Philippines District, Fr Chris is based at Davao City in his native Mindanao. He was joined by 'S&L' companions for a celebratory Eucharist on Nov 07 and by Australian confreres for dinner and coffee afterwards. Marists throughout the Pacific are mourning the sudden death of Fr Toma'akino Lakai SM (38) in a truck accident near Hanahan, Bougainville, on Nov 07. A former Marist seminarian, Chris Ulena, residing with Fr Toma, also died in the accident. 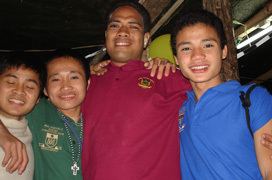 While still a seminarian, Tongan-born Fr Toma participated in 'The Other Half' journey of 2006-07, sponsored by Marist Mission Centre Australia and travelling to remote areas of Thailand and Cambodia, his gentle presence winning the hearts of refugee and disabled youngsters along the way. 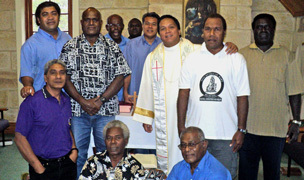 Since his ordination in 2009 Fr Toma worked in the Oceania Marist Province's Bougainville region after graduating from the Marist seminary at Bomana, PNG. He will be sadly missed by many in the Pacifc. May he rest in peace. with disabled youth in Cambodia. 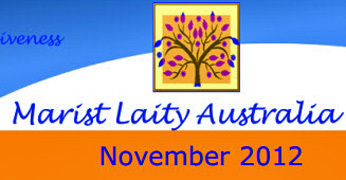 Provincial of the Marist Fathers in Australia, Fr Paul Cooney SM, has announced a number of key appointments, effective from Jan 01, 2013. Most are for periods of three years. Below, from left: Fr Ray Chapman (re-appointed parish priest, St Patrick's, Church Hill, NSW); Fr Paul Mahony (re-appointed parish priest, Gladstone, Qld); Fr Bernard McFadyen (appointed assistant priest, St Patrick's community, Church Hill, NSW); Fr Peter McMurrich (appointed superior of Villa Maria community, Hunters Hill, NSW); Fr Kevin Stewart (re-appointed director of Marist Mission Centre, Hunters Hill,NSW). 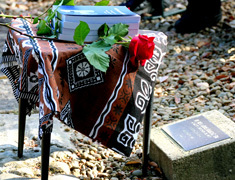 Marists from Asia-Pacific countries gathered for prayer on Nov 02 in the historic missionaries' cemetery in the grounds of Villa Maria monastery, Hunters Hill, NSW. Members of the 'Spirituality & Lifetsyle' program joined local Marists to remember deceased missionaries on the Commemoration of All Souls. 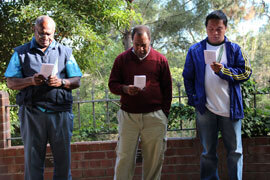 After the prayer copies of Oceania Province's memorial book of 700 missionaries were presented to local Marist communities in the picturesque setting. Links between the Australian S.M. 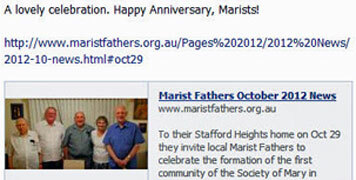 website and Marist Facebook friends have led to increased visits to the site. During October daily visits averaged over 300, peaking at 473 on Oct 29. Current 'hits' will approach a total of 3,000,000 in 2012. Many Marists in various provinces and units throughout the world are increasingly connecting through the social media.